While European politicians are wantonly destroying the advances made over the past seventy years of humanist progress, something else is happening in the neighbourhoods of Europe. Something that has no leader, but possesses an unstoppable direction. Something that is happening right outside your house, but also all over the world. I’m standing inside a converted military structure in Madrid, at Idea Camp 2017. These past three days, projects from Europe, the Middle East, and North Africa have been presented and redefined. It’s been an intense time, especially for the fifty project owners, who have been stretched thin between participating in workshops, working on their own processes, and supporting one another. Those of us who have been leading the work are struggling somewhat too, after planning communications strategies with Lebanese theatre groups one moment, and then discussing the consequences of Brexit for community housing in Britain the next. I know that what will stick in my memory won’t be the actual projects themselves, it will be the sheer number of initiatives and people who want to make, if not the world, then at least a small part of their city, a better place. That’s the most significant thing I’ve learned from being involved in Subtopia’s work with the Connected Action for the Commons programme these last three years. There are lots of people out there, working to make the world a better place, but most of them act on a smaller scale, close to their users. Because while European politicians are busy rolling back fifty years of humanist progress at a frightening pace, the opposite is happening in the neighbourhoods and courtyards of Europe. There are innumerable social projects in progress, beyond the reach of the European Commission and the political lotteries: village theatre projects, community gardens in Swedish courtyards, and cooking collectives in Zagreb. It’s difficult to place all these initiatives in a macro-political context in a way that makes sense, both because of their diversity and because of how they are geographically distributed. But there is an incredible number of these projects, and they are going on everywhere. A neighbourhood in Chisinau, Moldova, is building its own park, a Belgian circus collective is moving to the Spanish countryside to meet new people (and skilled welders), and in Liverpool, environmental activists and graffiti artists have come together to clean up the city’s air. Like I said, it’s happening everywhere. These initiatives are the products of a shared political and cultural climate, but the solutions they produce are local, their work is local, and their commitment is local – we’re witnessing the birth of a new civil society, one that has no place for spokespeople or policy specialists. The task of improving the world seems to begin right outside our doors, just a few steps away. Of course, the small-scale nature of these projects can be questioned. In many ways, their extreme local focus is their greatest strength, but it is also a distinct weakness. We need to understand them both as individual initiatives, and as thousands, or tens of thousands, of efforts being undertaken by a multi-faceted movement. A movement that has no manifestos, no headquarters, and no artistic leaders. And even though this movement is hard to define in standard copywriting terms, there are a number of common denominators that all of these projects share. Little, if any, ideological difference is made between social and artistic work. The projects are subversive, and the core of the movement consists of equal parts academics, artists, and activists. To be more specific: Almost all the people I’ve met these last few years identify as activists, and their work is highly subversive. But it is so in the sense that it solves problems that the public sector has not sufficiently addressed, and not necessarily in the traditional sense of being in opposition with the powers that be. That is to say, it’s more a case of soup kitchens and free internet than one of barricades and Bengal torches. The end of the world is nigh, at least if we are to trust the views often expressed in contemporary political debate, but I am seeing another reality much more clearly: Europe is a sea of good ideas. 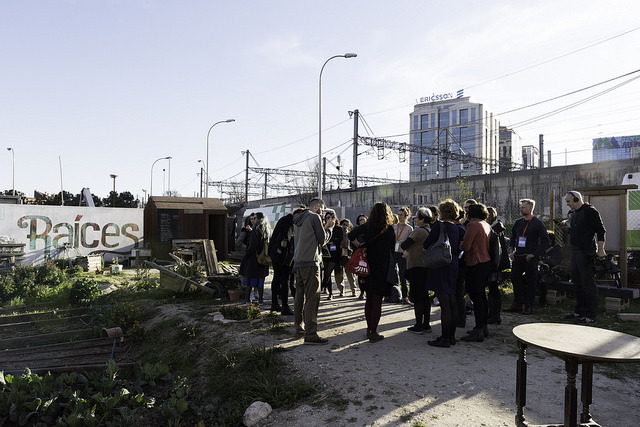 I work as a Project Coordinator for Subtopia within ECF’s Connected Action for the Commons programme. I started out in the advertising world (which I hated) and soon checked out and ran away with the circus, literally, working as a tour manager for Swedish contemporary circus company Cirkus Cirkör. The last few years I have been working as a Communication Director for Subtopia. When I’m not working with Subtopia, I am pre-occupied with other frameworking and content producing organisations spanning small theatre companies in the rural south of Sweden to European networks. I provide strategic support and organise events for, among others, Halmstad International Street Theatre Festival (Halmstad, SE), Trans Europe Halles (Lund, SE). I represent performing arts on the regional Creative Board of Skåne and spend most of my time in the (objectively) most beautiful place on earth (Swedish south coast).